Casita Paraiso translates to “little paradise house” and is a dream of ours in a magical land that we’d like to share with you. Explore the Maya civilization, full of ancient and archaeological wonders. You’ll find amazing and abundant treasures of the sea and jungle surrounding you. 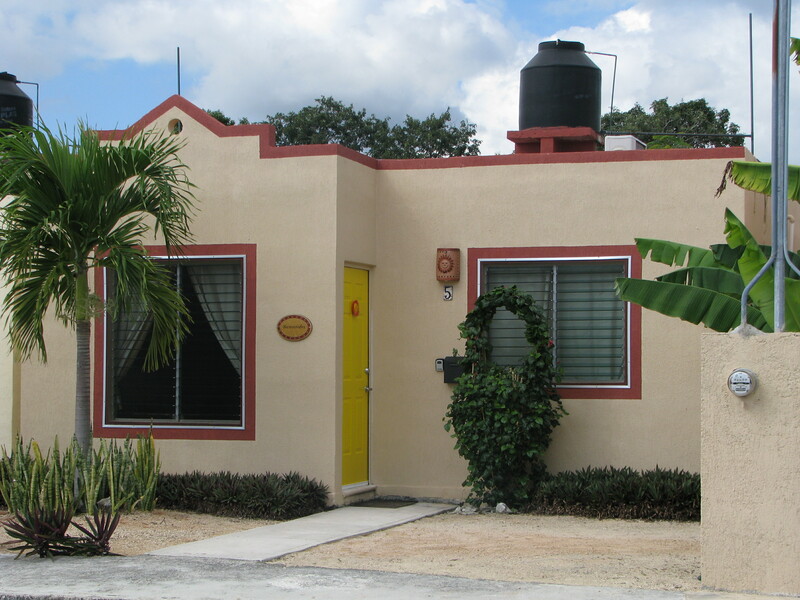 Casita Paraiso is a two bedroom bungalow, traditional in style and fully equipped making the perfect home base during your travels throughout the Yucatan Peninsula and beyond. Once you leave this land, a piece of your heart is forever left behind! We are located in Chemuyil, 90 minutes south of Cancun in the state of Quintana Roo which borders Belize and Guatemala to the south. This lovely community is gently tucked between sprawling, dense jungle scattered with cenotes and hugged by the Caribbean Sea. We are a mixture of homeowners who live here part-time, full-time or once in a while (practicing for retirement) from all over the United States, Canada and a few other far reaches­­­ of the globe. You’ll find other visitors from all over the world who come for a stay in Chan Chemuyil while on the Riviera Maya. Enjoy amazing adventures from diving and snorkeling the Caribbean, underground rivers, caverns and caves to kayaking, fishing and swimming with turtles and whale sharks to visiting Mayan villages and ruins. Casita Paraiso is just minutes to the very special playa, Xcacel. Picturesque and serene, this environmentally protected beach provides an important sanctuary for turtle nesting. The green and loggerhead turtles return each year to nest from May through September. Xcacel was voted one of the most beautiful beaches in Mexico and is located just across the highway.Take a walk along this lovely crescent beach….watch birds, build sand castles and visit a cenote. At the end of your active day you can take in an authentic meal in the neighboring pueblo of Chemuyil. This is a warm, delightful Mayan community where you can immerse yourself into the vibrant culture. The brilliant, turquoise water of the Caribbean is thriving with sealife and provides excellent snorkeling and scuba diving. The Meso American Reef or Great Mayan Reef is the largest coral reef formation in the western hemisphere and the second largest in the world making this a world class scuber diver’s mecca. You can enjoy some of the world’s best bone, permit and tarpon fishing in Quintana Roo. We welcome you. “Mi casa es su casa.” Please make yourself at home and enjoy the surrounding beauty and tranquil vibes that a vacation in paradise has to offer. This sweet, little casita will be your “home away from home”. Our on-site property managers are passionate about the care they provide during your visit. C’mon in and take a look around. We’ve provided some good information and links to other resources. Don’t forget to check our Photo Journal to get a taste of this beautiful area. We would love to help you plan a special trip to the Riviera Maya. A stay at Casita Paraiso and adventures in the Yuctan will warm your heart forever and leave you with great memories of a special vacation in paradise. Thank you Diane! You should come visit sometime! Hello!! Was recommended to you by carol van dyken.. My husband and I are looking for a condo/rental between nov 10-17 3013. Wondering if you could send me a price and availability? We are hoping to find a place close to the grand Bahia principe coba as we are attending a wedding there! Thanks so much- email is rubytuesday233@gmail.com. So sorry your trip was cancelled. Hope you’ll visit us in the future! I hope you were able to peruse our website. Please refer to our VRBO site to view our calendar and read more information about our casa.